Brands like IBM trust Eventbase to power their global event app, used at their largest conferences and smaller events. Your attendees deserve a beautiful, visually-engaging app that is far from boring. Our team will work with you to create a stunning design that is tailored to your brand with custom fonts, graphics and animations. We will make your brand look great and deliver an exceptional user experience that attendees – and your team – will love. 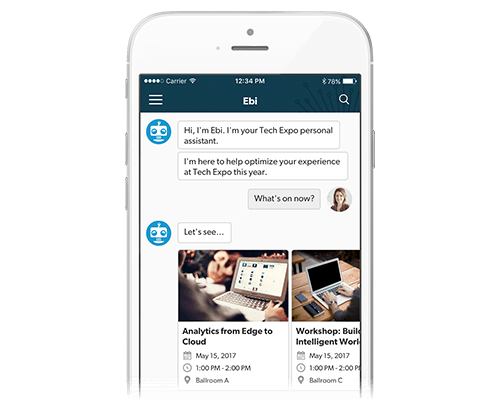 For your premium events, Eventbase is proud to offer the industry's most intelligent chat bot capable of answering complex questions about your event with visually rich responses within your event app. We also offer an advanced Recommendation Engine, which uses intelligent algorithms to guide attendees to sessions they may like and suggests attendees they may like to meet. Boost app adoption and elevate your attendee experience with engaging features like our Game, Activity Stream and Audience Interaction. You can also use Eventbase Manager to easily create and publish smaller Essential events in your Enterprise Event App with agenda details, networking features, floor plans, maps, and more. Bring your brand to life with a beautiful, visually-engaging event app that is a joy to use. We focus on design and usability, rigorously testing real-world use cases to ensure our product offers the best user experience so that your team and your attendees will love your app. Our technology is trusted by the world's largest events, including apps with millions of downloads, so you are in good hands with Eventbase. Want to run penetration testing or load test your app on your own private cloud? Eventbase has you covered with our enhanced hosting and security packages. Eventbase is the most award-winning event app platform because of our commitment to innovation. We pioneered ground-breaking technologies including an Advanced Recommendation Engine, the industry's most intelligent Chat Bot, and the use of beacon technology at events with features like hyper-local networking or "Find Me" indoor location. Events can be stressful. When you're on-site and focused all the details that will make your event memorable, you don't want to be worrying about your event technology. We offer multiple support packages to help you design and build your app, as well as onsite or 24x7 remote support to meet your needs.